Aho & Soldan was founded in 1925 in Helsinki, largely to enable a visual image of Finland as a newly born nation, and was active until 1961. 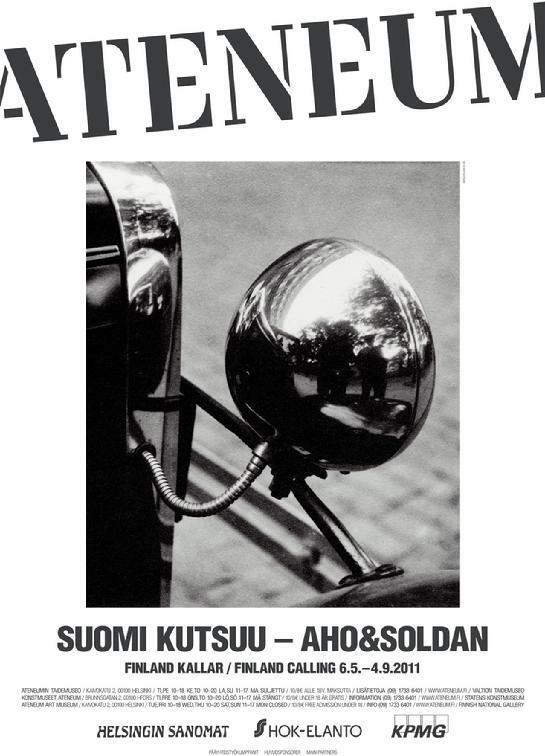 Heikki Aho and Björn Soldan were members of the ABISS-group (Aho, Brückner, Iffland, Setälä, Soldan) in the 1930´s, focusing on “New Photography” inspired by the Bauhaus. They focused on documentary photography as well as artistic photography and created thousands of pictures. 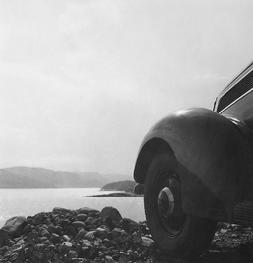 The group´s landmark exhibition at Salon Strindberg in May 1930 is regarded as a turning point in Finnish photography. 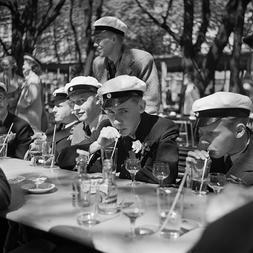 Their photographic work has been published in numerous magazines over several decades and has been displayed through a number of exhibitions such as at Helsingin Taidehalli, Helsinki 1930 and 1984, Salon Strindberg, Helsinki 1930, Alvar Aalto´s The Finnish Pavilion at The 1939 New York World´s Fair, The Finnish Museum of Photography, Helsinki 1987, The Finnish Film Archive, Helsinki 1992 and Musée d´art Moderne et Contemporain, Strasbourg 1999. Similarly, their films are shown regularly at film festivals in Finland as well as abroad. Several books featuring the work of Aho & Soldan have been published throughout 1930´s – 1950´s in different languages. 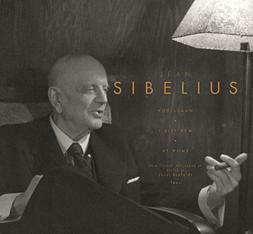 A new book published September 9, 2010 by Teos, "Jean Sibelius at Home" comprise 50 photographs from the film as well as articles by Claire Aho, Andrew Barnett, Markku Hartikainen, Ilkka Kippola, Robin Soldan, Marc Vignal and Timo Virtanen. The project does also include miniature exhibitions with 10 photographs each, as well as a main exhibition with 50 photographs - and also a DVD. Aho & Soldan´s work has recently been and will be commemorated in several ways in the near future. First, through exposure at the DocPoint Film Festival www.docpoint.info and http://www.kava.fi/esitykset/kevat-2010/docpoint-aho-soldan in Helsinki 26 - 31 January 2010, where also the recipient of the 2010 Aho & Soldan Lifetime Achiewement Award, Kiti Luostarinen, was announced http://www.docpoint.info/node/1062. Second, through participation in the Modern[ism] exhibition at the Design Museum in Helsinki 12 February - 9 May, 2010. Third, a major exhibition "SUOMI KUTSUU - FINLAND CALLING" was held at The Finnish National Gallery, Ateneum http://www.ateneum.fi/ in Helsinki 6 May - 4 September 2011. 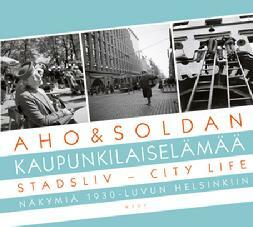 Fourth, an exhibition "KAUPUNKILAISELÄMÄÄ - CITY LIFE", at the Helsinki City Hall´s Virka Gallery http://www.virka.fi/en/virka-gallery/city-life-views-of-helsinki-in-the-1930s 1 June 2011 - September 4, 2011 displayed photographs from Helsinki in the 1930´s. Fifth, In connection with the exhibition WSOY has, May 16, 2011, published a book based on the same photographs. Sixth, Aho & Soldan´s production is highlighted in a movie "LASTUJA - SPÅNOR - SPLINTERS - A Century of an Artistic Family" about Juhani Aho, Venny Soldan-Brofeldt, Heikki Aho, Björn Soldan and Claire Aho - by the Finnish film director Peter von Bagh. The premiere was at Bio Rex in Helsinki on 28 August, 2011 at 19.00 in connection with the Helsinki Festival http://www.helsinginjuhlaviikot.fi/en/elokuva-kuvataide/event/7/221 and at the Ateneum-sali on 1 September 2011 at 17.00 - 20.00 The TV-premiere: YLE Teema on 10 September, 2011 at 21.00. Furthermore, a large and long-term international touring exhibition featuring photographs from the book "Jean Sibelius at Home" and Aho & Soldan´s exhibition and film "Finland Calling", which includes music by Jean Sibelius, is being planned for the years 2011 - 2017. Also, when feasible, the exhibitions leave room to include other photographs by Aho & Soldan´s vast archive as well. A long term project under development is the creation of an "Aho & Soldan Institute" to be located in Helsinki. It is intended to function as a place for research, seminars, exhibitions, film screenings etc - mainly based on and focused on Aho & Soldan´s production, including photographs and films by Heikki Aho, Björn Soldan - and "The Grand Old Lady of Finnish Photography" - Claire Aho www.claireaho.com. Her large exhibition "Age of Elegance", was held at Kunsthalle Helsinki http://www.taidehalli.fi/english/ 29 April - 7 August 2011, displaying fashion-, advertising- and cover photos from 1950 - 1967. For any information regarding films, photographs, books or any of the planned events, the planned Aho & Soldan Institute or if you have any request or suggestion or wish to participate in any way, please contact us by e-mail: info@ahosoldan.com. As the master composer disliked being photographed, Jean Sibelius was rarely caught on camera. In 1927 and 1945, the film company Aho & Soldan was allowed to shoot a documentary featuring Jean Sibelius at Home http://www.yle.fi/elavaarkisto/?s=s&g=8&ag=47&t=117&a=8909. This book contains 50 photographs selected from the films along with expert articles, (Teos 2010). Most of Aho&Soldan’s films were commissioned works, including advertising and propaganda films. Their most important films were made to promote tourism and industry and distributed internationally by the Ministry of Foreign Affairs. A silent version of their film Finland Calling was released in 1932. In 1936 and 1940 narrated compilations were released, praising Finland’s natural beauty, sights and attractions, modern way of life and industry. These films were released in numerous languages, attracting visitors from abroad and encouraging travellers in Finland. Finland Calling was also screened at New York World’s Fair in 1939 and 1940. In the 1940 release the happy days of domestic tourism and urban life end with the bombings of the Winter War. The brothers continued their work throughout the war, Heikki Aho with the Information Company of the Finnish Armed Forces and Björn Soldan on the home front.